Det blev en trevlig och intressant kväll för de DESS-medlemmar som hade sökt sig till Franska Skolan. Styrelsen fick ansvarsfrihet och Leif Jönsson, Bo Haufman, Claes Brodda och Peter Lee valdes om till styrelsen för en period av två år. Anders Asplund, Lars Björkman och Göran Wallén har ett år kvar på sina mandat. Rune Sjögren stod för kvällens föredrag, som han kallade Jazzatmosfär. Han berättade om sitt liv liv med jazzen från ungdomsåren till långt upp i livet och flätade ihop sitt kåseri med 12 väl valda inspelningar från 20-, 30-, 40- och 50-talet. Publiken fick bl.a. höra Slave to the Blues (Ma Rainey), Dippermouth Blues (King Oliver), The Sheik of Araby (Benny Goodman), Oh, Lady be Good (Count Basie), The Things We Did Last Summer (Fats Navarro) och Black and Tan Fantasy (Duke Ellington). Tack vare DESS’ allstäddes närvarande it-stjärna Göran Axelsson kan de DESS-medlemmar, som inte kunde vara på plats, höra eller se föredraget på sin dator. Det finns i avdelningen DESS-möten på webbplatsen i video-, ljud och textversioner Där kan man också höra alla låtar som Rune spelade. Efter pausen med mingel och tugg var det så dags för kvällens konsert, som Davor Kajfes stod för. Och det blev verkligen en höjdpunkt. ”Det var en upplevelse att höra honom”, sade Sonja och Conny Svensson efter konserten. Och många höll med. För de, som var med på Ellington ’94 i Stockholm, framkallade konserten också minnet av Davor Kajfes’ framträdande på Konserthuset med John Lewis. Det var en stark upplevelse! Den här gången bjöd Davor på en bred kavalkad av godbitar förknippade med Ellington och Billy Strayhorn som Take The ’A’ Train, In A Sentimental Mood, I Got It Bad, Satin Doll, Caravan, Lotus Blossom, Isfahan, C Jam Blues. Han avslutade konserten med en hyllning till Alice Babs och publiken fick höra Come Sunday, Heaven och All Mighty God. From the early Fifties we have a privately recorded performance from a Fraternity Party in Madison, Wisconsin, believed to be from the end of 1953. Despite a bit of distorsion in the recording, this is quite an enjoyable performance by the two piano players. 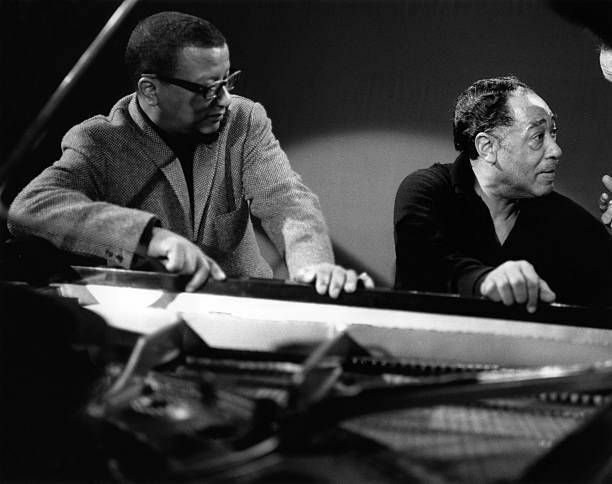 Duke is the main player, but in the middle of the tape, Billy Strayhorn plays three tunes, which makes possible an interesting comparison between the two piano styles. If they sometimes are are difficult to distinguish from each other when composing or arranging music, they are much simpler to keep apart when playing the piano. Click on the arrow below and you’ll be listening to Duke, playing one of his originals called Falling Like A Raindrop, a rarely played composition, only encountered three times in the New Desor discography. The second ”goodie” in February is program 34 in the Duke Ellington series broadcast by the Danish Radio in the mid-1980s to the mid-1990s. The broadcast is available in the ”Goodies” section of the website. This program was broadcasted on October 13, 1985 and presented by Bjarne Busk. It starts with a snapshot from Ted O’Reilly’s interview of Ellington in Toronto on March 17, 1970 in which Ellington talks about his stockpile of unreleased recording. Next comes New Concerto For Cootie recorded on September 13, 1962. The day before Cootie Williams had rejoined the Ellington orchestra and recorded Ellington’s welcoming piece for him – Tutti For Cootie. The broadcast then moves on to the February 1957 stockpile recording session, from which Busk let the listeners hear C-Jam Blues and In A Sentimental Mood with Paul Gonsalves soloing. He shares this role with Clark Terry in ”C Jam Blues”. 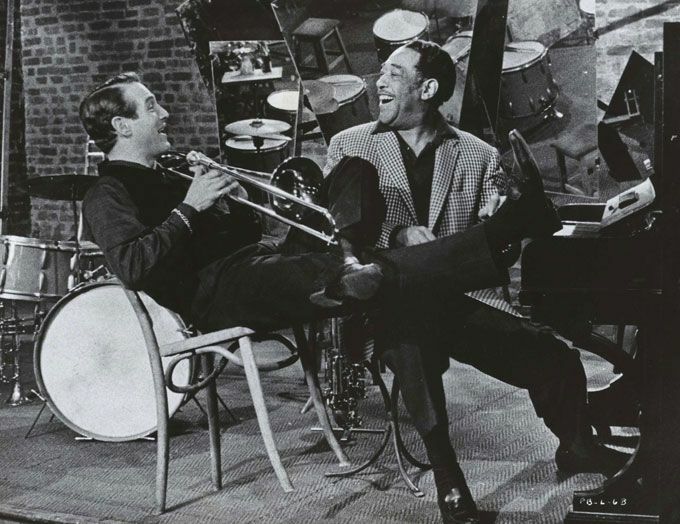 After this, Busk features in the program an Ellington’s medley of French songs recorded on February 27, 1962 – My Heart Sings, My Man and No Regrets. The last two are Edit Piaf songs – Mon Homme and No Je Ne Regret Rien – and the first one an early 1940’s song Ma Mie written by the team Henri Herpin and Jamblan and first recorded by Jean Sablon. The first ”goodie” in February is program 33 in the Duke Ellington series broadcast by the Danish Radio in the mid-1980s to the mid-1990s. The broadcast is available in the ”Goodies” section of the website. This program was broadcasted on September 29, 1985 and was presented by Bjarne Busk. It is totally dedicated to the stock pile recording session December 28-29, 1966. The session took place in the RCA Studios in New York. Busk starts with what transpired on the second day, which was Tony Watkin’s day. He recorded three Ellington songs – I’m Just A Lucky So And So, Blues At Sundown and The Lonely Ones. The first one was originally a number for Al Hibler and the second one sung by Jimmy Grissom on a couple of occasions in 1952 and in My People. Before Watkins, ”The Lonely Ones” had been recorded by Johnny Ray and the Ellington band for Columbia on September 26, 1958. and by Milt Grayson in a stockpile session on September 13, 1962. None of the songs recorded by Watkins and played in the broadcast have been issued on K7, LP or CD so far. Next in the broadcast , Ellington sits down at the piano for some meditation. On the tape box, the number is simply called Piano Track 1. Later it became Meditation.